In the previous post, I discussed how phylogenetic trees, while powerful and informative to trained eyes, can be misinterpreted by lay audiences. These misunderstandings are easy to diagnose, but actually finding solutions to the problem is challenging. In a perfect world, every child would be introduced to evolutionary theory early and often in their obligatory science education, and everybody would be able to interpret phylogenetic trees the way scientists do. This is unlikely to happen anytime soon, especially in the United States, so educators are going to have to get creative. One option is to provide additional information to aid in the interpretation of the diagram. On the surface, adding more information is always an attractive prospect, but unfortunately it does not always work as intended. Attention spans are perilously short, and the goal of a visual representation should be to make the content immediately intuitive and easier to understand. If conventional shapes and symbols in evolutionary trees are not getting the intended message across to target audiences, then perhaps we need to rethink how we are structuring these trees. I don’t have a catch-all solution, but the following might be enough to at least start a conversation. Torrens and Barahona argue that many misinterpretations of trees stem from ideas of essentialism and teleology that are deeply ingrained in and continually reinforced by western culture. Likewise, equating up with good and down with bad is a recurring, internalized motif. Therefore, trees that illustrate evolution and diversification proceeding upward or to the right only encourage presuppositions of linear, goal-oriented evolution. One solution that has been experimented with (at AMNH, for example) is to draw trees as circles (see below). This eliminates the problem of associating up with good and bad with down, or upward movement with progress. A circular “tree” has no orientation, and thus does not imply any taxa to be better than the rest. Personally, I find circle diagrams confusing to read, but I appreciate what they are intended to accomplish. A diagram of evolutionary relationships could theoretically take any shape, since the crucial information is in the branching order, not the nature of the lines. A circular tree. From eplanetscience.com. Many phylogenetic diagrams place specific fossil taxa at nodes along the tree in order to illustrate the course of evolution. This is informative of general evolutionary trends, but it can also be confusing. As a case in point, I just did an image search for a horse evolution diagram to use as an example, and found that many of the top results came from creationist websites. These sites aren’t worth linking to (although they are easy enough to find), but they erroneously assume that fossil taxa are thought to be directly ancestral to modern Equus caballus. Evolutionary scientists think no such thing, but looking at the image below I can see how that conclusion could be reached. This diagram of the evolutionary history of horses can lead to the mistaken assumption that earlier species are thought to be directly ancestral to later ones. That polytomy that leads to three unlabeled nodes doesn’t help either. In a proper cladogram, taxa are only placed at the ends of branches. Direct ancestry is (almost) never inferred, because the scarcity of the fossil record prevents us from ever knowing exactly what evolved into what when. The cladogram below shows the relationships between the seven modern-day species of Equus. Systematists have determined a series of branching relationships based on anatomical and molecular data, and even provide a suggestion of when these divergences occurred, via the time scale. Each node represents a common ancestor that definitely existed, but we will probably never find or identify their fossils. A cladogram of modern horse species. From Hooper Virtual Natural History Museum. In this case, I would prefer if books or exhibits for popular audiences nixed images like the first one and instead went with cladograms that do not suggest specific ancestor-descendant relationships. Obviously the cladogram could be spiced up with colors and illustrations, but it is important to use a format that represents precisely what scientists do and do not know. Individuals well-versed in evolutionary science automatically read trees from the basal node out to the tips. Typically, and in the elephant phylogeny above, that would be from the bottom up. 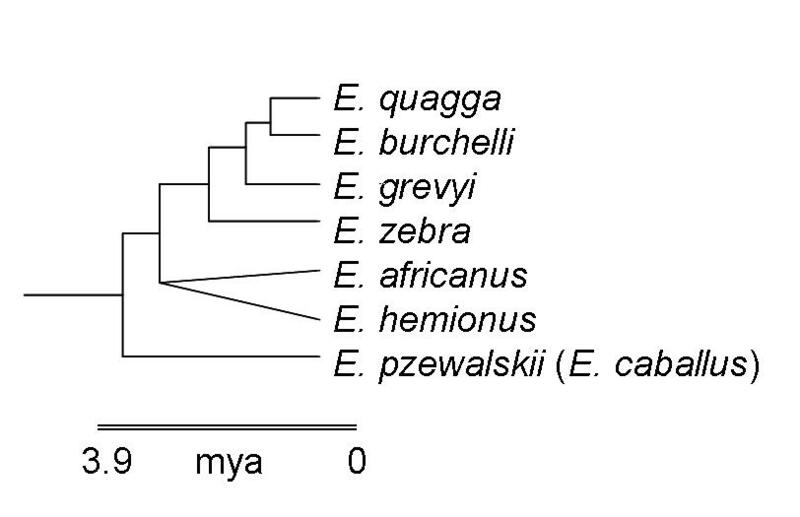 It can therefore come as a surprise (it certainly did for me) that non-specialists frequently attempt to read phylogenetic trees from left to right. Viewers may assume that the horizontal order of taxa across the top is significant, representing either the course of evolution or time. 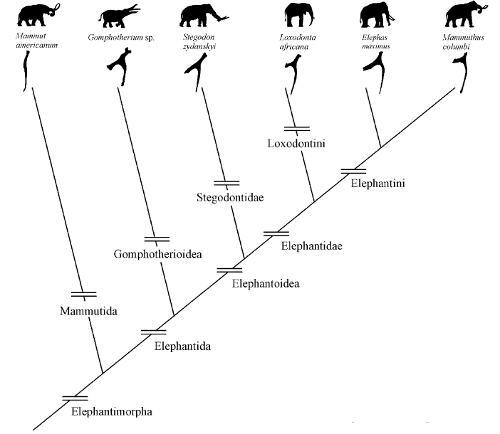 Neither would be correct, as Mammut on the far left and Mammuthus on the far right were roughly contemporaneous, and Loxodonta africana and Elephas maximus in the middle are the only extant elephants. Although it may not occur to specialists, it is a simple and necessary precaution to label the orientation of the tree and avoid such confusion. This is more of a nomenclature issue than a visual one, but poor graphics can exacerbate this misconception. All contemporary species, from sponges to frogs to humans, have been evolving for the same amount of time. An amphibian or reptile is not “primitive”; it is just as adapted to its environment as we are. Using this sort of terminology is attractive as a shortcut when referring to less-diverse sister groups to more-diverse clades, but it misrepresents the nature of evolution and should be discouraged.